If you attended or heard about the first Tailings and Mine Waste 2011 conference (TMW) which arrived in cIRcle in 2011, then you will want to check out the upcoming TMW 2015 conference proceedings to be archived in cIRcle, UBC’s Digital Repository. Leading experts from all over the globe attended the Tailings and Mine Waste 2015 conference – hosted by UBC’s Norman B. Keevil Institute of Mining Engineering, in conjunction with Colorado State University and the University of Alberta – and was held in Vancouver, British Columbia on October 25-28, 2015. Sharing the latest, innovative ways for sustainable tailings and mine waste management well into the future by offering the best practices, case histories, timely topics and technologies possible, these experts engaged a wide audience – from student to faculty researchers, scientists and engineers to mine waste managers, regulators, professional agencies and others in the mining industry. Key topics presented in the 90+ accepted abstracts included timely topics such as “mine waste facilities design, management systems planning, case histories, environmental engineering, closure and reclamation”. What’s next? Watch for Part II of our TMW 2015 conference proceedings’ blog post coming soon! Interested in other openly accessible mining conference proceedings from 1977 to the present? It is a pleasure to announce that the WCILCOS conference papers and handbook are all available in cIRcle, UBC’s Digital Repository! Explore this collection and find papers, webcasts, etc. on topics about Chinese pioneers, family policy, national identity as well as these community areas: the Moy Kwok Village, the Sa Duoy Village and New Westminster in British Columbia, Canada. Discover and learn more about the WCILCOS collection in cIRcle at: https://circle.ubc.ca/handle/2429/43391. Coming soon – Recent issues of UBC Forestry’s Branchlines and Annual Report publications will be added to cIRcle, UBC’s Digital Repository. Stay tuned for more details on our cIRcle blog and if you haven’t already, follow us on Twitter: @cIRcle_UBC (https://twitter.com/cIRcle_UBC). The WCILCOS (World Confederation of Institutes and Libraries in Chinese Overseas Studies) is a federation established by participating institutes and libraries in a Chinese Overseas Studies conference in Athens, Ohio, in 2000, to facilitate co-operation between scholarship and documentation, and between institutes, libraries, and archives in different parts of the world. Registered in Ohio, it is non-profit and non-political. No membership dues are collected. Since the inception of WCILCOS in 2000, the Dr. You-Bao Shao Overseas Chinese Documentation Center has served as its secretariat, and devoting its resources to the Confederation’s goals and visions. 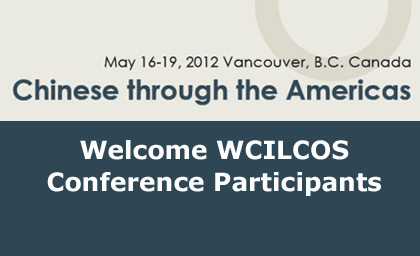 The WCILCOS conference was held May 16-19, 2012 at the University of British Columbia’s Point Grey campus with 150+ international delegates in attendance. It was the ‘first time UBC has been invited to host the WCILCOS Conference, and the first time it has been hosted in Canada. Eleanor Yuen, Head of UBC’s Asian Library, has helped organize WCILCOS conferences since 2003’. We hope you will take a few minutes to peruse the new WCILCOS conference papers collection in cIRcle at: https://circle.ubc.ca/handle/2429/43391. An electronic copy of the Register of Chinese Immigrants to Canada was preserved at Library and Archives Canada (LAC) in Ottawa. It was created between 2005 and 2008 as part of a research project on immigration from China to Canada directed by Professors Peter Ward and Henry Yu of the Department of History at the University of British Columbia. See this popular cIRcle item which has had 500+ views in the History Faculty Research collection at: https://circle.ubc.ca/handle/2429/36347. Above partial excerpt in italics and image are courtesy of the UBC Library website at: http://about.library.ubc.ca/2012/05/15/ubc-library-welcomes-wcilcos-2012/. Convening more than 120 speakers and 700 delegates from five continents, the UNESCO International Conference: Memory of the World in the Digital Age: Digitization and Preservation will foster vital exchange among sectors as diverse as academia, heritage institutions, the IT industry, business organizations and government. > Enhancing digital creation and preservation, especially with “born-digital” records, documents, data and archives. Experts from UBC Library and UBC’s School of Library, Archival and Information Studies (SLAIS) will be participating in various sessions throughout the three day conference, which starts September 26 at the Sheraton Wall Centre hotel. Media requesting interviews with UBC Library or SLAIS representatives on-site should contact either Lorraine Chan at 604.822.2644 or Linda Ong at 604.827.4831 for assistance. UBC Library is pleased to announce that, in cooperation with the Ohio University Libraries, it will host the 5th WCILCOS International Conference of Institutes and Libraries for Chinese Overseas Studies. The event will be held May 16-19 at UBC’s Point Grey campus, and will focus on “Chinese through the Americas.” More than 150 delegates from around the world will gather in Vancouver to present and discuss research topics and findings. Keynote speakers include Dr. Henry Yu (Department of History, UBC) and Prof. Guotu Zhuang (Xiamen University). Conference presentations will be shared via UBC’s cIRcle. This is the first time UBC has been invited to host the WCILCOS Conference, and the first time it has been hosted in Canada. Eleanor Yuen, Head of UBC’s Asian Library, has helped organize WCILCOS conferences since 2003. On behalf of UBC Library, we extend a warm welcome to all WCILCOS attendees! 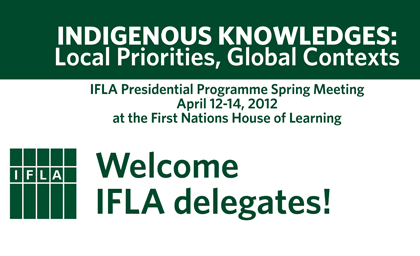 The International Federation of Library Associations and Institutions (IFLA) Presidential meeting is happening this weekend at the First Nations House of Learning. The theme of the international meeting is on a topic of growing importance and interest in the world of culture and information: Indigenous Knowledges: Local priorities, Global contexts. This meeting will be the opportunity for all those interested in Indigenous and traditional knowledge, its creation, organization and access, to better understand the local and global issues under discussion in various parts of the world and by many types of cultural, heritage, and community groups and organizations. UBC Library welcomes the international visitors to our campus. For those who are unable to make the sessions at the Longhouse on Friday and Saturday, webcasts are available online. For more information on the meeting, please visit the IFLA website. Are you interested in mining? The proceedings of the upcoming Tailings and Mine Waste 2011 conference (TMW) will soon be publicly available in cIRcle, UBC’s institutional repository. The conference will be held in Vancouver November 6 to 9, 2011. Organized by the Norman B. Keevil Institute of Mining Engineering at UBC, in conjunction with Colorado State University and the University of Alberta, the conference appeals to researchers, engineers, scientists and mining representatives interested in issues related to mining. Issues of environmental science and engineering, geochemistry and other topics related to tailings and mine waste will be covered during the sessions. Eugene Barsky, Liaison Librarian in Science and Engineering, Dirk van Zyl, UBC Mining Engineering Professor and TMW Chair, cIRcle staff and UBC Library’s technical services staff worked together to make sure the conference would have global access in cIRcle. Content from the conference, including more than 70 conference papers, will be ready for the opening session on November 6. Stay tuned to read the proceedings of the conference – all online through cIRcle! If you are interested in mining, check out the BC Mine Reclamation Symposium proceedings (1977-2010), also publicly available in cIRcle. For more information on cIRcle, including how to deposit your scholarly research, visit cIRcle’s website.